Among the materials they’re using is Luther’s Small Catechism with Explanation—2017 Visual Edition, donated from the generosity of others through Concordia Gospel Outreach. With its easy-to-navigate visual format and engaging illustrations, the Visual Edition is leading these men to a better understanding of the Old Testament, the New Testament, and Christian Lutheran doctrine to teach in their communities. And it’s also giving them leadership class material that’s “pre-seminary” for those who might have a desire to continue their formal education through Concordia Seminary’s Ethnic Immigrant Institute of Theology (EIIT), a specialized program for those who aspire to serve immigrant and refugee communities as Lutheran pastors. 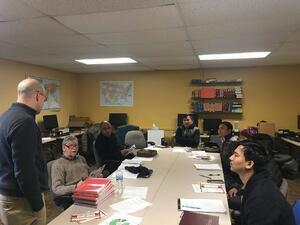 Please pray that the Lord will continue to equip current and future leaders in ethnic communities through the work of CFNA and through partnerships such as this with CGO, and with instruction done in the leadership class with pastors like Al Buckman and Stanish Stanley of CFNA, Matt Clark of Ascension, and Michael Tanney of St. John’s.